Anderson Cooper shown on the left is holding the white dog. There is no other mainstream media news platform that is as controlled by the C.I.A. as CNN. The lead anchor of the Communist News Network, as it’s also known, is none other than LGBT champion Anderson Cooper. As a matter of fact, every top journalist within the Mockingbird Media is either a full-time CIA operative or part-time contractor. A quick scan of the last 500 broadcasts that Cooper has given from his high perch at CNN will reveal a rabid hatred of all things Trump. In point of fact, his every news report oozes with antipathy towards President Trump. It’s also clear that Cooper methodically makes ups stories about the POTUS in a way never seen before on network TV. He literally fabricates extremely negative stories about Trump which CNN passes off as patently fake news. How does a top anchor get away with such shameless and reckless journalism? How does any high-profile anchor even think they can routinely make up stories out of thin air about the POTUS… … …without any consequences whatsoever. As a leading advocate of the LGBT agenda, Cooper has long been controlled by forces that are far more powerful than him or CNN bigwigs. Even though he’s a card-carrying CIA agent, his true handlers are well above The Company, as the CIA is known in intelligence circles. The essential point is that Cooper is a typical CIA operative whose masters have meticulously groomed him from childhood. And, it all began with his mother—Gloria Vanderbilt. This CIA MKUltra minding control programming began early in Cooper’s childhood, as it often does with the media stars and cultural VIPs throughout American society. They do this by way of Pedogate, the primary control mechanism of the entirety of Deep State. No one ever gets on or leaves the Deep State reservation without first being initiated into Pedogate. See: PEDOGATE: Pandora’s Box Has Been Opened for Deep State and the C.I.A. Cooper’s entire life trajectory fits the pattern of a Manchurian Candidate profile who has virtually no say about his future. In other words, every element of Cooper’s life, and especially his powerful occupation, is determined by his handlers at the C.I.A., who are told explicitly what to do by their Illuminati masters. 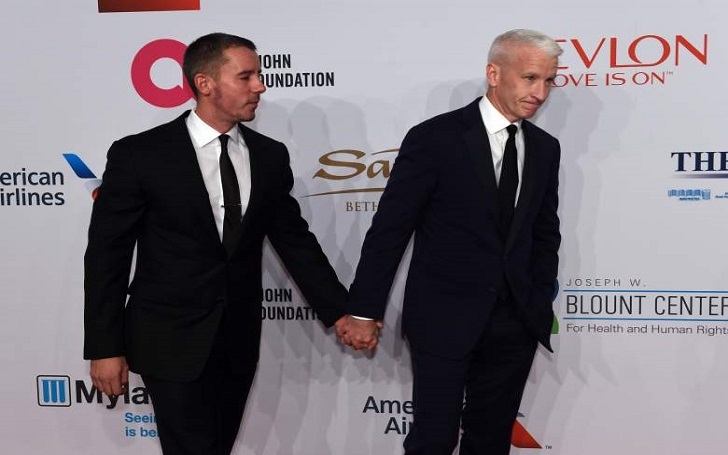 Why does CNN keep an overly zealous gay advocate like Anderson Cooper, who has deeply offended and repulsed millions of viewers, in the top spot during prime time for so long? Answer: Anderson Cooper is the perfect pawn who will say anything his handlers tell him too without hesitation or an iota of conscience. In short, he’s their man, and they will never have another perfectly manicured MKUltra public persona like him. Operation Mockingbird was completely successful at owning and operating every single MSM news outlet in America and beyond. In the process of doing so, the C.I.A. corralled a massive stable of presstitutes who only serve the National Security State and Corporate Oligarchy, always at the expense of the American people. Anderson Cooper makes no secret about his homosexual orientation and gay lifestyle as the following photos attest to.